Finally the wait is over! World's cheapest handset is all set to unveil in India's market. The provider expects deeper Internet penetration in rural India with the launch of Freedom 251 smartphone. This ground-breaking move is not only likely to boost the number of mobile internet users in India but the number of people that buy insurance online will also increase manifold times. As more people can afford a smartphone, the better will be the reach of online insurance policy among common mass. Accessing internet on Freedom 251 smartphone will be hassle-free as the specifications of the phone include quality hardware such as 1GB RAM and 1.3GHz quad-core Processor and software like Android 5.1 Operating System. According to the provider, this handset will be available to customers by June, 2016. The development of Freedom 251 was supported immensely by Indian Government. The product is going to be the outcome of 'Make in India' which is the flagship scheme by Indian Government to inspire domestic companies and MNCs to make products in India. This unbelievably cheap Freedom 251 smartphone can potentially realize the vision of Digital India. The timing of the launch of Freedom 251 mobile phone couldn't have been better as India's insurance industry is going digital at the same time at a rapid pace as well. The number of mobile internet users was 303 million till December 2015 and the figure is set to exceed 314 million by 2017. However, the introduction of Freedom 251 is expected to propel the growth even faster. Online insurance market is all set to tap into this enormous growth. Online insurance market increased by 88% every year for the last 5 years in India. Insurance search volume has risen to a whopping 13 million in 2015 from just 2.2 million in 2010. The advent of ultra low-cost smartphones like Freedom 251 coupled with reduced mobile tariffs will empower consumers in the hinterland of India to access internet and buy insurance online in the coming months. So far, 7.35 crore people booked the Freedom 251 phone. Even if just 20% of this people use the phone to buy online insurance policy, about 1.5 crore extra online policy will be sold. Undoubtedly, the launch of the Freedom 251 phone provided the much-needed boost to India's online insurance sector. GIBL has already simplified the process of buying insurance online. It hardly takes a few minutes to compare insurance policies and make an informed purchase online insurance plan on this premium online insurance marketplace. 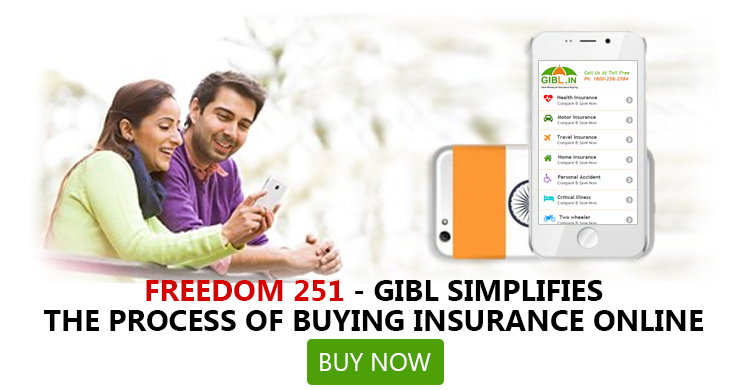 Once people will receive their Freedom 251 phone they wil be able to download GIBL's mobile app from Apple App Store on their phone and make use of this app to compare insurance quotes on the go and buy insurance online instantly. Introduction of Freedom 251 will not only ensure that 'Everyone just a call away' but also everyone in India is just a few clicks away from insuring themselves through GIBL.IN. Why you should go for GMC and GPA as an Employer?